In a bombshell story published by The Daily Beast, Rich McHugh, a former producer for Ronan Farrow, the star reporter who wrote the landmark report detailing Harvey Weinstein’s years of sexual abuse against employees and actresses, has alleged that while Farrow was working on the story, NBC tried to prevent the story from going to print. Farrow’s series of articles on Weinstein’s abuse went on to win him a Pulitzer Prize in public service for the New Yorker, who shared the prize with The New York Times. NBC denied that officials within the network did not try to quash the story, but rather that further reporting needed to be done before it went to print. The United States International Trade Commission has announced that it will block the Trump administration from implementing tariffs on newsprint from Canada, in a major win for the news industry and print publications. NMA gathered 19 members of Congress from both parties to testify before the Commerce Department to urge them not to adopt these tariffs, which viewed as crippling to the news industry, especially print publications. Chavern visited BNN Bloomberg to discuss what the latest development means for the news industry. You can watch his interview here. 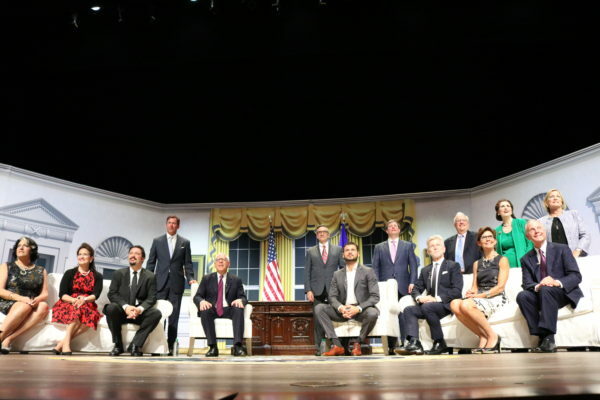 The largest gathering of descendants of presidents gathered on the Kennedy Center stage for The Presidential Sites Summit. 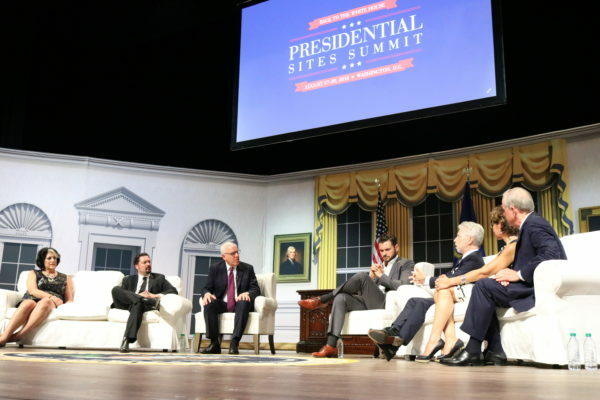 The once-every-two-years event hosts the operators and administrators of presidential libraries, historical sites, and the descendants of America’s presidents. As part of the festivities, participants gathered at the Kennedy Center on Tuesday, August 28th. Kennedy Center president Deborah Rutter brought out Washington Post publisher Fred Ryan to welcome participants and kick off the night. David Rubenstein, Chairman of the Board of Trustees at the Kennedy Center, then moderated a series of discussions including stories from the White House told by presidential descendants with Susan Ford Bales, Daughter of President Gerald R. Ford, Clifton Truman Daniel, Grandson of President Harry S. Truman, Massee McKinley, Descendant of Presidents William McKinley and Grover Cleveland, Lynda Johnson Robb, Daughter of President Lyndon B. Johnson, and Tweed Roosevelt, Great-grandson of President Theodore Roosevelt. 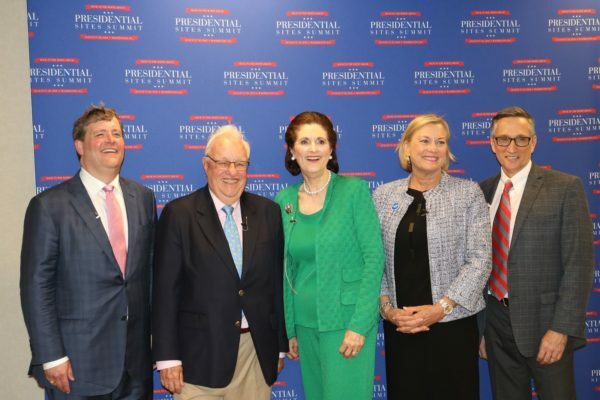 Rubenstein also hosted a discussion on “The White House Behind the Camera” featuring an introduction from Anita McBride, chair of the Presidential Sites Summit and the Chief of Staff to First Lady Laura Bush. Panelists included Adan Canto, star of Designated Survivor, Tammy Haddad, President & CEO of Haddad Media and HBO, Mack McLarty, chairman of McLarty Associates, Chief of Staff to Bill Clinton, and consultant on Designated Survivor & White Down, Capricia Marshall, House of Cards consultant and Social Secretary to Bill Clinton, documentarian Kirk Saduski, and Jamie Vanderbilt, the writer and director of White House Down. David Rubenstein asked Kirk Saduski, who produced the HBO miniseries’ John Adams and Band of Brothers, how hard it is to maintain accuracy when creating these films. Saduski agreed with Haddad that filmmakers demand precision in the way events in the White House are portrayed, from official White House protocols and hierarchies to the norms and social mores of living and working in the White House. The segment ended with David Rubenstein telling his most embarrassing moments from working in the Carter White House. You can watch more Presidential Sites Summit events live on CSPAN here. Photo Courtesy of Dog Tag Bakery. 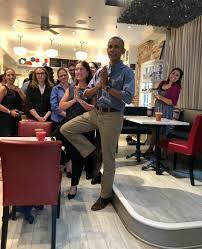 Dog Tag Bakery, a disabled veterans hiring and education bakery, where President Barack Obama and Vice President Joe Biden had lunch last month, is now accepting applications for the 2019 fellowship class. The application is open to all post-9/11 military veterans with service-connected disabilities, military spouses and/or caregivers. Dog Tag works in partnership with Georgetown University to provide a professional development program designed for members of military families in order to help make the transition into the civilian workforce. The program combines business and entrepreneurship coursework, personal development opportunities, and hands-on rotations throughout Dog Tag Bakery, the small business venture. During the Fellowship’s five months, fellows explore a variety of career paths and establish both personal and professional networks. When finished, the program provides graduates a certificate in Business Administration from the School of Continuing Studies at Georgetown University, scheduled rotations within different areas of the organization, as well as networking opportunities with business leaders and entrepreneurs. Being an alumnus of the Dog Tag Fellowship mean you will be business-ready, competitive, and employable. You can read more about the Dog Tag Bakery Fellowship and apply here. Interested in supporting the fellows? You can Visit, Donate, or have your event Catered with Dog Tag today! Together we are #BakingADifference in the lives of service-disabled veterans and military families! Representatives from numerous social media and tech companies including Twitter, Google, Facebook, Microsoft, and Snapchat are convening in San Francisco on Friday, August 24th to discuss their strategy for the upcoming midterm elections. 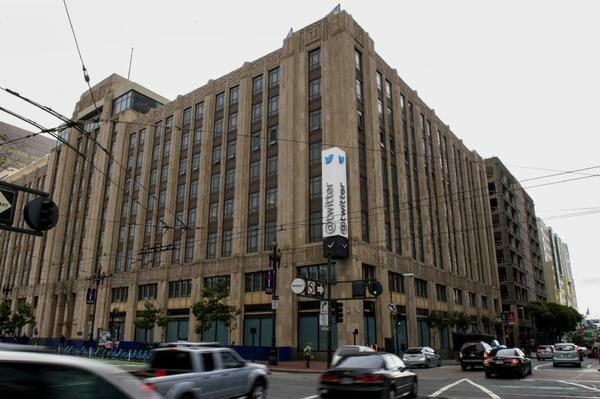 Invited by Nathaniel Gleicher, head of cybersecurity for Facebook, the representatives will assemble at Twitter headquarters for the talks. These tech companies have come under intense scrutiny for their role in enabling misinformation to play a part in the 2016 election. The meeting comes days after Microsoft discovered and shut down six phishing sites registered by Russian military intelligence. Omarosa Manigault’s new book Unhinged: An Insider’s Account of the Trump White House says that Fox News managers send talking points to President Trump every day. Now a new report, by Hunter Schwartz from CNN’s Coverline, reveals from May 22nd to August 22nd President Donald Trump’s Instagram account has reposted 85 photos or videos from either Fox News, Fox Business, or “Fox & Friends,”. That’s about 24% of Trump’s 358-total posts in that time frame. The pattern appears to be: Trump tweets, then Fox News turns the tweet into a graphic, sometime later the graphic ends up back on President Trump’s accounts, creating a type of social media feedback loop. Last week, Trump speechwriter Darren Beattie was fired from his post at the White House after revelations surfaced that he had participated in a panel at the H.L. 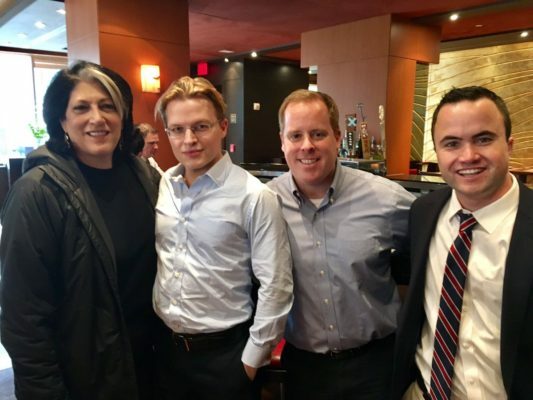 Mencken Club, an alt-right summit of sorts which previously hosted fellow-white nationalist Richard Spencer, with Peter Brimelow, a white nationalist and publisher of anti-immigrant website Vdare.com, in 2016. It now seems that another Trump administration official has been spotted with the controversial figure, this time National Economic Council Director Larry Kudlow. 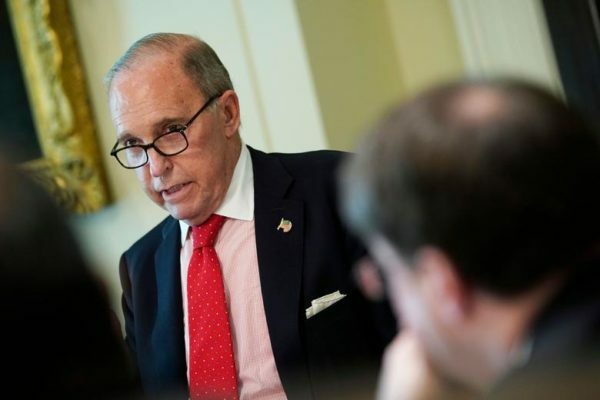 The Washington Post reports that Brimelow was among the attendees at Kudlow’s birthday party at Kudlow’s home in Connecticut on Saturday, August 18th. Kudlow is a former CNBC host and former Reagan administration official. He was named director of the National Economic Council by President Donald Trump in March. Brimelow founded the anti-immigrant website Vdare.com in 1999 and is seen as a leading figure in the white identity politics movement. Vdare is named after Virginia Dare, the first English-born child in what is now the United States, a symbol that has been adopted by white nationalists and anti-immigrant activists. Other guests at the party include more dubious names including Trump allies Roger Stone and Newsmax CEO Christopher Ruddy, and pundits CNBC’s Michelle Caruso-Cabrera and Fox News anchor Brian Kilmeade.